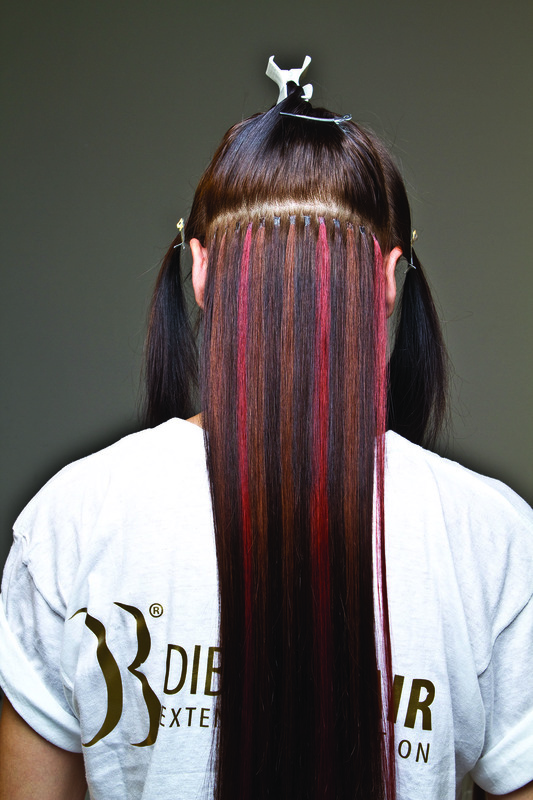 The Perfect Way to Introduce Di Biase Extensions in Your Salon! Interested in getting started with hair extensions but not sure where to start? An intro kit is a great way to get a head start with all of the tools and supplies you need to get started as a professional hair extensionist. Check out the kits below to see what is included in each kit and feel free to get in touch with us should you have any questions! 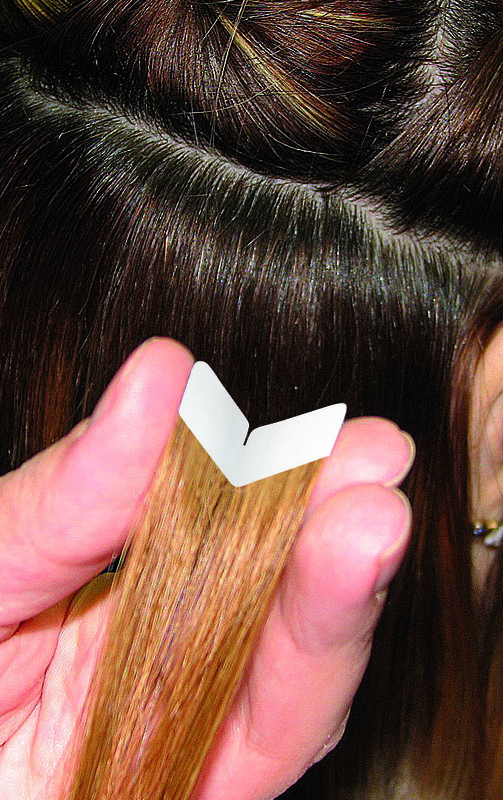 A hair extensionist must have for I-Tip extension application. With a hook on one end and a loop on the other, this tool makes it easy for stylists to apply I-Tip extensions on client’s hair. With a comfortable grip in the center and a durable sturdy base, you can quickly and effectively move through the application process. After application of the bead with the hook for ring, use the assembly pliers to securely clamp the client’s hair in place using these assembly pliers. Only for use with I-Tip hair application. Disassembly pliers are required to remove extensions. To disassemble I-Tip hair, use these pliers to gently glide bonds out of hair for painless and damage free removal of extensions. Click here to order kit. We recommend using 2-3 packs of 2cm hair hair and 1-3 packs of 4cm to complete one head of hair. Have questions? 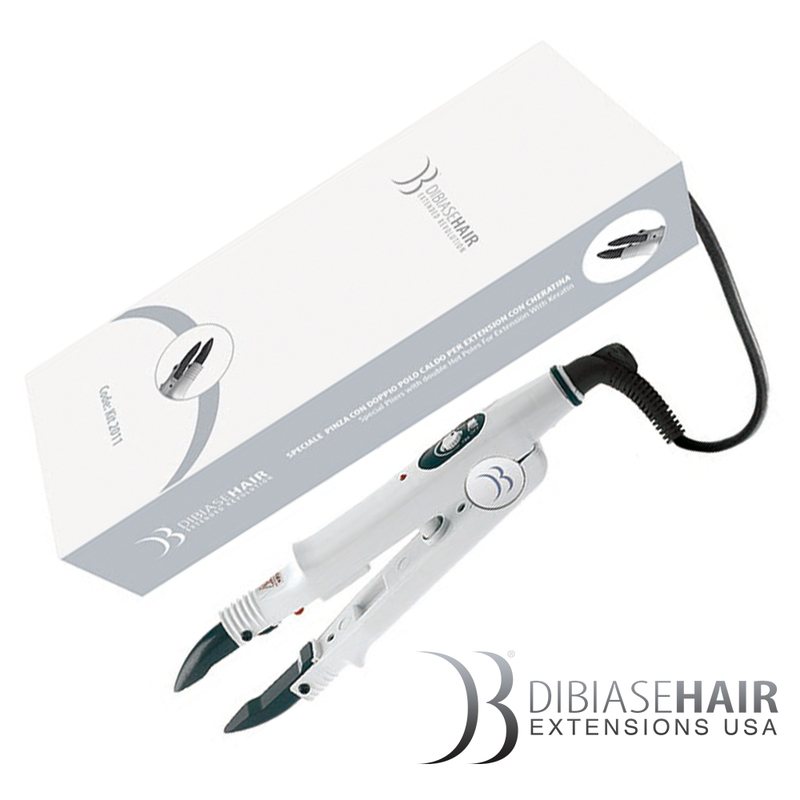 Contact us at (248) 489-8900 or email us at info@dibiasehairusa.com. Di Biase Pro Tip: Get Your Dream Hair in Your Sleep! While having hair extensions provides clients with confidence and beauty, there are a couple of home care responsibilities that you need to remember. If you want your client to have a good hair extension experience and have them coming back again and again, it is crucial that they know how to properly take care of their hair. Picture this scenario: You just spent a few hours putting in an amazing set of fusion hair into a client who is new to extensions. She is ecstatic and promises to take very good care of her new set of extensions. In a couple weeks, she travels to a lake and spends the day swimming and relaxing with friends. Throughout the day, she makes sure to run her hands through her hair to prevent it from tangling. Once she gets home, she immediately combs through her hair, showers with the right products and goes immediately to bed afterwards. She then calls you and says her hair doesn’t feel the same and doesn’t understand whats going on. What happened? Can you spot the mistake? In order to best prolong the lifespan of your hair extensions, it is crucial to make sure you take the important steps to take proper care during not only the day time, but also when you sleep. Although this client did the right thing throughout the day, because she went to bed with wet hair AND left it down, she is more than likely going to cause damage to her hair. Repeat this process a few nights and you have a recipe for matted hair. The proper thing to do after the day at the lake would have been to either allow the hair to air dry or blow dry it. After this, putting the hair in a light braid or a low ponytail is ideal to allow the bonds to relax and the hair to get a rest after the day. Don’t forget to repeat this to your clients and make sure they know the steps they need to take in order to best take care of their hair at all times! We also have a home care guide that is available for your use when necessary. If you have a tip you’d like to share with the Di Biase community or have any other questions about Di Biase extensions, please send it in to media@dibiasehairusa.com or call us at (248) 489-8900. Online visibility is everything. Make it easy for clients to find your extension services by creating a dedicated page for your extensions, including before and afters, on your salon website. By doing this, you are separating the extension services, giving it an exclusive feel and drawing more attention to the service. If you don’t know how to build a website, there are lots of helpful sources that make it easy to create and populate a page with relevant content. Sites such as Wix.com allow anyone to quickly and easily create a website without having any web experience. After you make your website, take it to the next level by adding your social media pages. If you don’t have social media, take a look at the next tip. The first thing that people do when they find out about your salon is look you up online, making attractive social media pages critical to promote new business. At a minimum, create a Facebook and Instagram page with your salon logo and contact information so clients can easily locate you and find out what your salon is all about. When you have created this, populate the page with before and afters, videos, client selfies and any other content that showcases the services that you offer. When you have a client in your chair, use the opportunity to show them how amazing hair extensions can be. Have a brochure or flyer nearby that is easily displayed and can pique the interest of your client without having to do any extra work. Another example would be to have a slideshow or hair extension video playing on salon screens. Displaying signage, banners, posters or flyers in the salon are all great ways to attract those already in or near your salon. If your salon is on a busy street, put something on the windows so that people on foot are immediately attracted to what your salon has to offer. Try utilizing a variety of materials to see what works best for your salon. Featured image: Gina Ralston at Belleza Salon of O’Fallon MO uses a Di Biase decal on her car to advertise Di Biase extensions on the go! This is a great example of utilizing marketing materials anywhere you are. You can order Di Biase marketing materials by contacting us at info@dibiasehairusa.com. Once you have someones interest, draw them in fully by offering an exclusive deal on extensions. Percentage discounts, free products and discounted services are all common discount methods that help to bring clients in. Use specials and discounts to your advantage by advertising them on your website and social media pages and giving people a reason to talk about your salon. Encourage those who do have extensions to share them with their friends and family. A great way to spread the word is simply to get people talking! Wherever you go and whatever you do, talk about your extensions, especially if you wear them yourself. Hearing and seeing great hair will get others excited about hair extensions and having them want extensions for themselves! 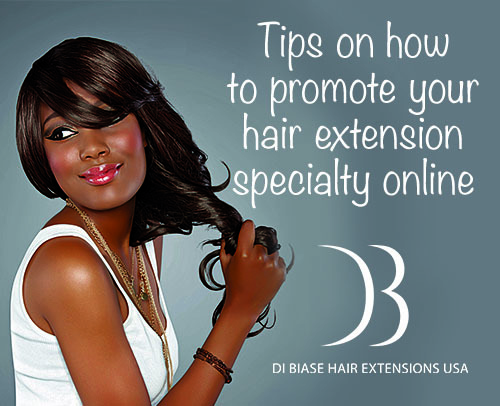 For more information and a more in depth look on how to reach a wider audience, click here to access an article from Di Biase COO, Dale Aho who gives tips on “Making Your Hair Extension Business A Profit Powerhouse.” Have your own tip or something you wanted to share with stylists who are looking to bring in more business? Comment below with what has worked for your salon! I’ve been in the industry for 20 years and I’ve been working with hair extensions from very early on. I am always delighted by the quality of hair and variety of methods available from Di Biase. I have so many stories from my time behind the chair. My very first full head hair extension client had a pixie cut and wanted hair down to her waist. Knowing what I know now I would never have recommended hair extensions but at the time I was determined to show off my new skill set. 450 fusion strands and 8 hours later I had created one of my biggest client transformations as a stylist. Of course, that pales in my mind next to the experiences I’ve had transforming cancer survivors and alopecia sufferers. There’s nothing more rewarding than giving someone themselves back. My biggest tip for stylists starting into the world of hair extensions is to start small. Don’t do what I did. That first head was the most frustrating experience I’ve ever had with hair extensions. Starting with smaller applications for color or thickness allows you a bit more wiggle room for learning as you go. The best marketing strategy I’ve come up with so far is encouraging my existing clients to be more open about wearing hair extensions by creating a referral program to reward them. Great hair extensions don’t show so it’s not like people are walking up and asking where they got them done. Many clients don’t want anyone to know they wear hair extensions. The fact remains that word of mouth is the most effective means of gaining new hair salon clients and this is a way of getting them to spread that for you. 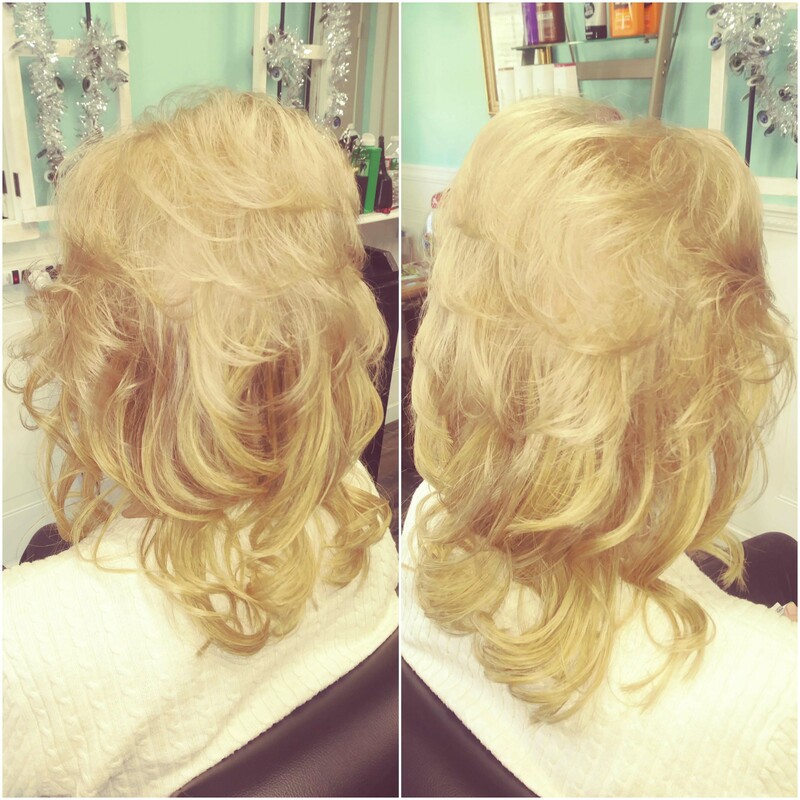 Featured Image Caption: One of Christine’s many extension before and after’s! 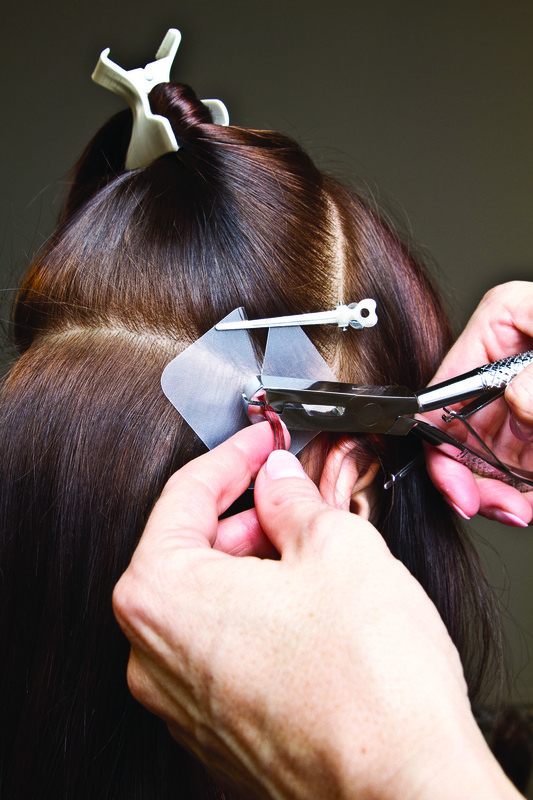 Di Biase offers fusion, tape-in/sticker, i-tip and clip in extension options that fit everyone and every lifestyle. Find out more about Christine at ElanyImage.com and ChristineRinehart.com! Have your own transformation story to submit? We’d love to hear from you! Email us your story along with your contact details, social media pages and pictures or videos to go along with your transformation in order for a chance to be featured on our blog and social media. Hope to hear from you soon! One of my clients, Sue, was with her friend one night when they had one too many drinks and decided it would be a good idea to cut her hair. Well 5 uneven inches later, Sue had a cheekbone length bob! Sue walked into my salon as a new client and was completely mortified about her hair. That’s when I suggested Di Biase hair extensions. I knew that they would allow her to have long hair again and help her feel much better. We made the appointment, and the rest is history. After that, there was no more haircuts from the “friend” and she has her length back. The following is an after picture of Sue’s hair. Thank you to Di Biase for giving me the tools and education to help Sue feel more confident! Story submitted by Stylist Marie Arsenault of A Little Hair Salon in Leicester, MA. Find her on Instagram at @hairmakeuplola and on Facebook as Hair.Makeup.Lola. When utilizing hair extensions in your chair, it’s important to remember just how creative you can get with a variety of styles. Because stylists can treat it almost like they would regular hair, virtually any look is possible. We took a moment to ask Lola Hondl what inspired this two-tone look and what exactly she did to make it possible. Read below to find out how she did it! How did you achieve this look for your client? The two toned look I did on my client was for her birthday, she wanted long beautiful hair! I custom colored her extensions to match her color, which I did as well. I used Goldwell for the deep purple and Pulp Riot for the lavender. Purple is her favorite color and I love the light to dark contrasts in hair. 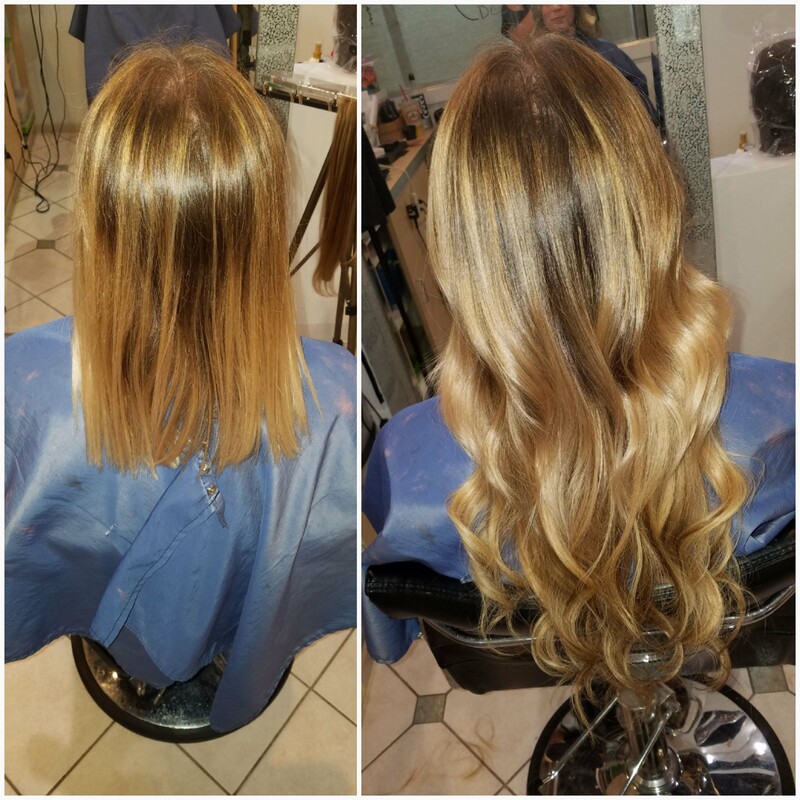 After finishing her color and having a clean dry canvas, I started with ten pieces of 20″ tapes, working my way up the head into 60 pieces of 20″ fusion hair. The entire process took about 5 hours and she was absolutely ecstatic with the final look, as was I! What advice do you have to other hairstylists? My best advice to other stylists is to believe in yourself!! Never be afraid to put yourself out there. Have a great support system and don’t get involved with negative people. Sometimes that means letting someone go. Find what it is in this industry that you love to do and run with it and be kind to everyone! You never know who is gonna be the person who makes your dreams come true!! For Di Biase sticker hair, click here. For Di Biase fusion hair, click here. 2017/2018 Di Biase Training Schedule! Get fusion application certified and an overview in Tape-In/Sticker and I-Tip extensions! Water tolerant & high quality, Di Biase extensions use a unique flat wrap technique to ensure virtually undetectable, flexible bonds that are exceptional in comfort and durability. 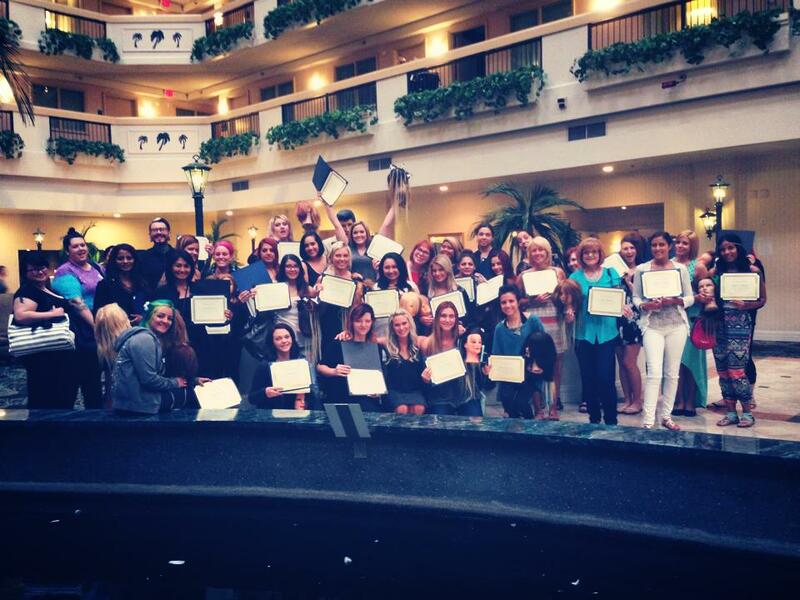 The Di Biase Fusion class covers everything you need to know to get started as a fusion hair extenionist from washing, prepping, consultation and pre-cutting, to installation, post cutting and how to market hair extensions for the most profit. This class also goes over the technique for tape-in/sticker and i-tip extensions. Taught by a certified hair extension stylist, you will walk away with all of the skills and knowledge you need to get started with your own hair business. LOCATION: TBD. Class Location Will Be Emailed To Registered Students. Please message, email us at info@dibiasehairusa.com or call us at (248) 489-8900 with any questions or special class dates requests! Fusion hair is applied on a lock by lock basis. Extensions come in packs of 20 locks, with a lock consisting of multiple strands of double drawn hair joined together by a thin keratin bonding strip. The stylist will individually attach each lock to the client’s hair (near the base of the neck) through use of heating pliers (hot tool) applied to the keratin bond. Fusion extensions should last approximately 4-6 months and will eventually need to be replaced as the normal hair grows out. The research carried out in the laboratory of Di Biase has always been the strong point of Di Biase Hair. Today, Di Biase boasts an innovative element that brings to the forefront the scientific expertise of the research team of the company: from the laboratory of Di Biase Hair comes the line “Hair Waterproof”. A new patented process that allows the bonds to be more tolerant of water from swimming and saunas. All fusion extensions come in 20 bonds per 1 pack of hair. Fusion hair is available in different lengths: 12 inch, 16 inch, 20 inch, and 24 inch in straight, wavy and curly. Build your own website, blog, and/or online portfolio showcasing your knowledge and talent as a hair extension specialist. -Because many people turn to the internet to search for new stylists and hair extensionists, having your own website to showcases your hair extension specialty can be an effective tool in marketing yourself as a stylist. -Make sure to use keywords that are relevant so your site will show up in internet searches. For example, pick keywords such the city where you work and words like “hair extensions” and “hair stylist”. -Be searchable on the internet. When creating a website, make sure that your website is listed in popular search engines such as yahoo and google as well as professional directories such as thehairextensionguide.com. -Include and a way for visitors to contact you so they can book an appointment. -Include a biography about yourself as a stylist listing your certifications and education. -Use quality before and after photos that show off your work. -Using a blog is a great way to show off your knowledge as a stylist. Blogs can include photos and/or articles about anything of your choice. WordPress.com is a great free blog hosting website that you can use for free. 2. Even if you already have a blog or website, people must be directed to it to be aware of the information on your site. Social media is a great way to achieve exposure to your website. Americans spend on average, 37 minutes a day on social media. That is higher than any other major Internet activity including email! -Facebook, Instagram, Pinterest, and Twitter are just a few of the many social media outlets to use in marketing. -Facebook: Facebook has over 1.15 billion users and 23% of them check their Facebook 5 times a day! You can use Facebook to create a fan page with your own Facebook account or just use your personal Facebook account to post before and after pictures, blog articles, and other interesting things that can link the user to your website. -Pinterest: Pinterest has become a popular website to post and share hair styles. With 69% of the users being female, many of them are searching for wedding hair styles, hair extensions, and haircolor to get inspiration for their hair. You can use your Pinterest account to upload your own hair extension photos or re-pin other users photos that you like. -Twitter: Twitter is a micro-blogging social media network that allows users to share short, limited messages. You can use twitter to engage followers by sharing photos, videos, links to your website, blog, and pages. Twitter has over 500 million users! -Instagram: Instagram has been one of the most popular forms of social media in the recent years. Its easy to use your smart phone to take photos of your hair extension work to post on Instagram. You can also connect Instagram with your Facebook and Twitter accounts. 3. When making posts on social media, don’t forget to use hashtags so that when others search for a hashtag, what you posted will show up in their search. Also, be sure to be engaged with others and make sure to follow people who follow you. Hair Extensions for Your Wedding Day. Every bride wants to look beautiful on their wedding day. From the dress to makeup and hair, every detail is important. There is no better time to try hair extensions than for your wedding- They are the perfect solution to get the look you want for your special day. Many brides desire to have long hair for their wedding day so they will grow it for months in advance. Those who have a hard time growing out their hair may be left with thin straggly hair that looks like its in need of a haircut. Hair extensions can be a great solution to anyone who wants to add thickness and/or length to their hair for their wedding. Di Biase Hair Extensions USA offers temporary clip-in hair extensions and more permanent solutions such as sticker hair and fusion extensions. They are a perfect solution for creating an amazing wedding hairstyle! 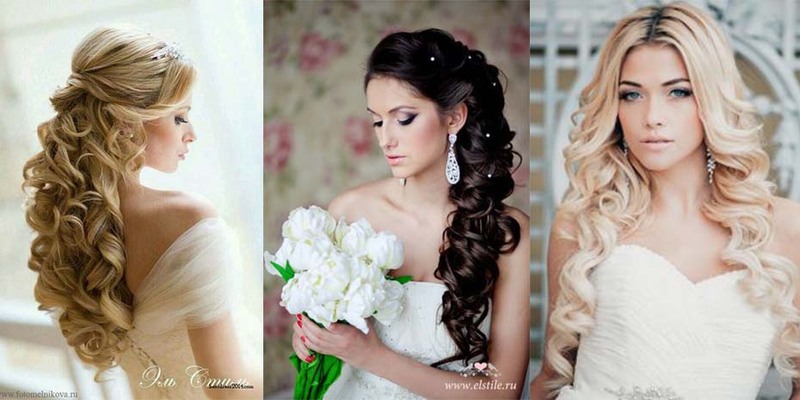 Beautiful wedding hairstyles can be achieved with the help of hair extensions. 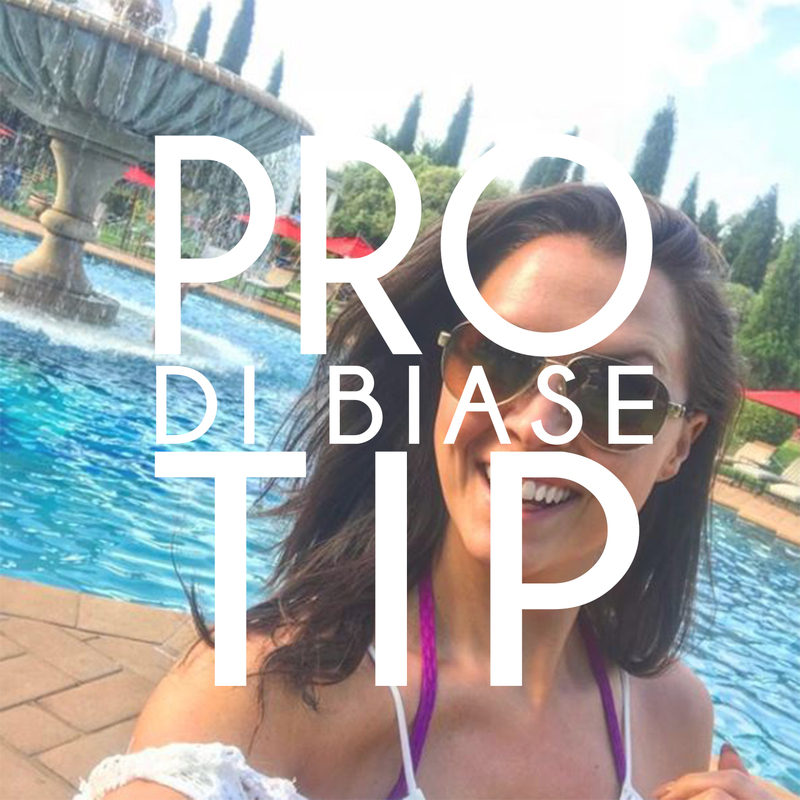 Di Biase Clip in Extensions are a great option for people who don’t want a commitment to hair extensions- they can be applied and removed whenever they want. They are also quick and easy to apply without the help of a stylist. 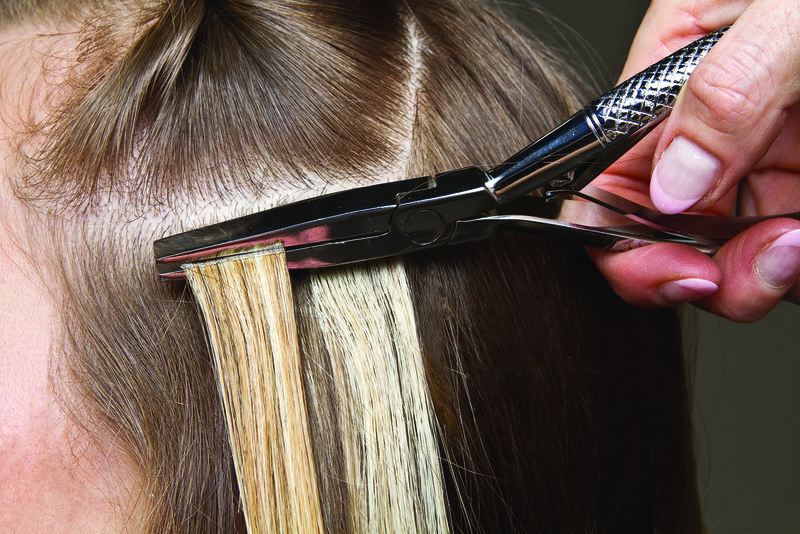 If properly taken care of, clip in extensions can last for years. Cost- $299 for a full set. Di Biase Sticker Hair is a great option because they can be applied quickly by your stylist in less than an hour. 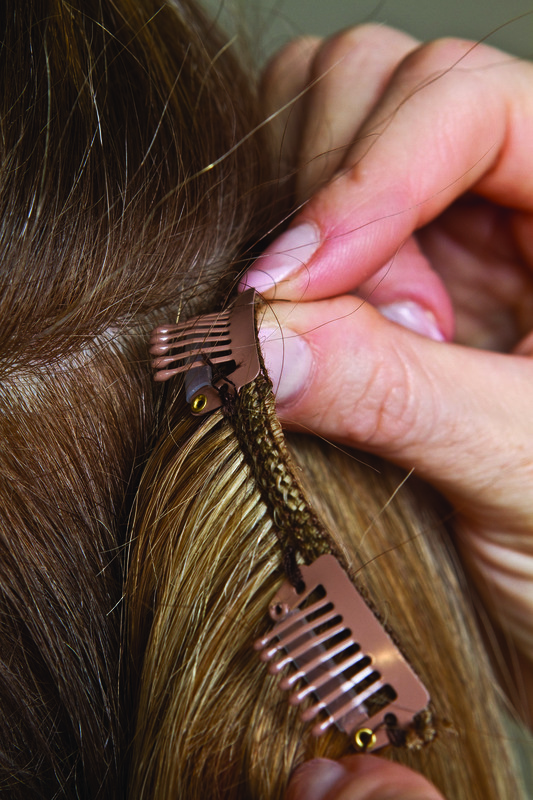 Your stylist will apply the hair by removing an adhesive strip and applying the adhesive to the normal hair. It’s removed by applying a solution and sliding the extension off. They can also be worn for 1-2 months and with proper care, they can be reused 3 times; Your stylist will just need to remove and reapply the adhesive tape. Cost- $600 and up (average price). Di Biase Fusion Hair Extensions are a great option for someone who wants their extensions to be more permanent- they can last 4-6 months if properly taken care of. They are a great choice for women with thinning hair because the bonds are small and lightweight. Fusion hair is applied on a lock by lock basis. 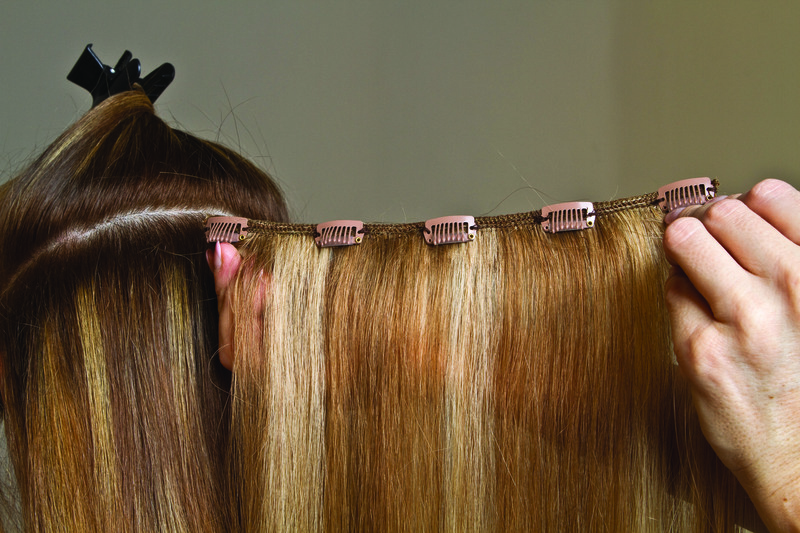 The lock consists of multiple strands of hair joined together by a thin keratin bonding strip. The stylist will individually attach each lock to the client’s hair with the use of heating pliers (hot tool) applied to the keratin bond. Fusion extensions are seamless and versatile so the hair can be worn in an up-do without the bonds showing. Cost- $800 and up (average price). Visit Di Biase Hair Extensions USA or email info@dibiasehairusa.com for more info or to find a stylist near you!